TITULO: .DO YOU WANT TO KNOW A SECRET? VOLUME 1: 1962-1972. WITH A LITTLE HELP FROM JOHN, PAUL, GEORGE & RINGO. 12CD + 3 DVD BOXSET. NEW. SEALED. LIMITED AND NUMBERED EDITION 16/400. 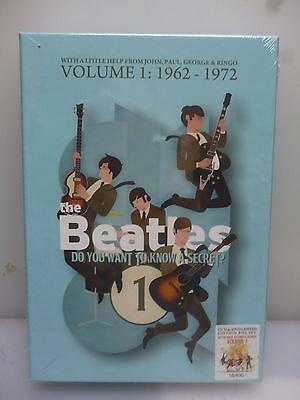 FORMATO: 12CD + 3 DVD BOXSET (13,5 X 19 X 3 CMS). INCLUDES A 20 PAGE BOOKLET WITH THE COMPLETE TRACKLISTINGS. LIMITED AND NUMBERED EDITION 16/400. 12CD + 3 DVD BOXSET COLLECTION OF ALL THE SONGS THE BEATLES WROTE FOR OTHERS, AND/OR APPEARED ON THE SESSIONS FROM 1962 TO 1972. THE DVDS CONTAIN PROMO CLIPS AND TV APPEARANCES. 12CD + 3 DVD BOXSET (13,5 X 19 X 3 CMS). INCLUDES A 20 PAGE BOOKLET WITH THE COMPLETE TRACKLISTINGS. LIMITED AND NUMBERED EDITION 16/400. ESTADO: NUEVO.PRECINTADO. NEW SEALED. MINT. WE SEND A NEW & SEALED ITEM. SHIPPING COSTS: ESPAÑA: 4,85 EUR. (CARTA CERTIFICADA). AUSTRIA, BELGIUM, FINLAND, FRANCE, ITALY, PORTUGAL, UNITED KINGDOM, CYPRUS, CZECH REPUBLIC, ESTONIA, HOLLAND, HUNGARY, LATVIA, LITHUANIA, MALTA, POLAND, SLOVAKIAN REPUBLIC, SLOVENIA, BULGARIA, ROMANIA, GERMANY, SWITZERLAND, DENMARK, GREECE, IRELAND, LUXEMBOURG, NORWAY, SWEDEN, RUSSIA AND REST OF EUROPEAN COUNTRIES: 5,95 EUR. (REGISTERED AIR MAIL). USA, CANADA, SOUTH AMERICA, ASIA, OCEANIA AND REST OF THE WORLD: 8,29 EUR. (REGISTERED AIR MAIL). * POLITICAS DE GASTOS DE ENVIO Y MANIPULACION / SHIPPING COSTS, HANDLING & POLICIES. WE DO COMBINED SHIPPING. PLEASE ASK IF YOU HAVE ANY DOUBT. THE SHIPPING ALLOWS TO SEND A CERTAIN WEIGHT. MAYBE OTHER ITEMS WILL BE ADDED WITHOUT INCREASE IT. ASK IF YOU HAVE ANY DOUBT. - LOS ENVÍOS A ESPAÑA SE REALIZARAN MEDIANTE CARTA CERTIFICADO/PAQUETE AZUL. -CARTA CERTIFICADA 6/7 DIAS- PAQUETE AZUL). - EL TIEMPO DE ENVIO DEPENDERA SIEMPRE DE CORREOS Y NO DEL VENDEDOR. - LAS TARIFAS QUE APLICAMOS PARA ESPAÑA SON LAS OFICIALES DE CORREOS DE ESPAÑA VIGENTES. - NO APLICAMOS NINGUN RECARGO EXTRA. - LOS ENVIOS LOS HACEMOS CON MAXIMA PROTECCION EN CAJA DE CARTON Y PLASTICO PROTECTOR DE BURBUJAS. -WE DO COMBINED SHIPPING. PLEASE ASK IF YOU HAVE ANY DOUBT. THE SHIPPING ALLOWS TO SEND A CERTAIN WEIGHT. MAYBE OTHER ITEMS WILL BE ADDED WITHOUT INCREASE IT. ASK IF YOU HAVE ANY DOUBT. - SHIPMENT WILL ALWAYS BE BY REGISTERED AIR MAIL. - WILL USE CARD BOARD BOXES WITH STIFFENERS PROTECTED. - THE SHIPPING COSTS FOR SPAIN ARE THE OFFICIAL POSTAGE RATES FROM SPANISH POST. - WE DO NOT ADD ANY AMOUNT FOR PACKING MATERIALS. * CONDICIONES Y PLAZOS DE PAGO / CONDITIONS & TERMS OF PAYMENT. 1- TRANSFERENCIA BANCARIA A NUESTRA CUENTA / BANK TRANSFER. 2- ACEPTAMOS PAYPAL / WE ACCEPT PAYPAL. 3- NO ACEPTAMOS ENVIOS CONTRAREEMBOLSO. - LOS ENVIOS LOS REALIZAREMOS TAN PRONTO VERIFIQUEMOS LOS PAGOS. - PREGUNTA AL VENDEDOR LAS DUDAS QUE TENGAS ANTES DE PUJAR. - PIDE EL TOTAL ANTES DE PAGAR AL VENDEDOR. SI NO PUDIERAS HACER EL PAGO EN EL TIEMPO ESTABLECIDO. - UNA VEZ PASADO EL PLAZO Y SINO TENEMOS NOTICIAS, INFORMAREMOS A EBAY DEL IMPAGO. - DEVOLUCIONES: CONSULTA AL VENDEDOR. - VOTOS NEGATIVOS: ANTES DE EMITIR UN VOTO NEGATIVO CONTACTA CON NOSOTROS PARA SOLUCIONAR EL PROBLEMA. BEFORE BUYING. PLEASE REQUEST THE TOTAL BEFORE PAY.